An Innovative Featherboard Design That Provides Consistent Tension And Maximum Holding Pressure Created By Unique Split Rail Construction. 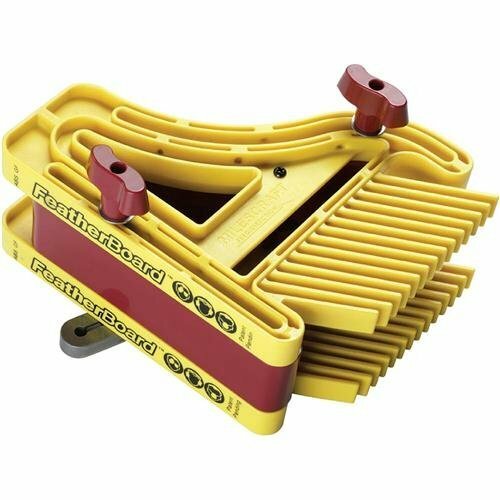 Pre-Load Tension Design Maintains Consistent Pressure Across Face Of The Featherboard. 2 Each Of 5/8" And 3/4" Metal Miter Bars, That Fit All Standard Miter Slots And Four 1/4" T-Track Bolts. Dual Slide Motion And S-Style Knobs Provide Quick, Easy, And Proper Installation And Prevent Overtightening Damage To Components. High Visibility Yellow Makes Units Easy To Find In Busy Shops. Includes All Parts And Hardware Necessary For Tandem Featherboard Use On Most Router Tables And Table Saws. If you have any questions about this product by Milescraft Inc., contact us by completing and submitting the form below. If you are looking for a specif part number, please include it with your message.